Home Editorials 13 Nephilim Skulls Found In Mexico? So much of what we have been taught about ancient history is simply not true. According to Mexico’s National Institute of Anthropology and History, a team of archaeologists working close to the Mexican village of Onavas has made an amazing discovery. They reportedly found 13 ancient human specimens that had grossly elongated skulls. You can find original photographs of this discovery right here, but the descriptions of the photos are in Spanish. The Mexican scientists are telling us that these skulls are approximately 1,000 years old, and that no skulls of this nature have ever been found in this region of Mexico before. So exactly what is going on here? Are these elongated skulls simply the product of an ancient technique known as “cradle-boarding”, or is there another explanation? 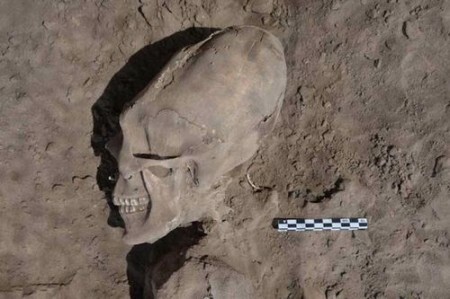 Could these actually be Nephilim skulls that prove that an ancient race of hybrids once roamed the planet? You might want to hold on to your hat – because the truth might shock you. So what would cause a skull to become elongated like that? Well, without a doubt “cradle-boarding” (also known as cranial deformation, head flattening, or head binding) can produce an elongated skull in a young child. And “cradle-boarding” is a decent explanation for most of the elongated skull specimens that we have found around the globe. In Paracas, on the coast of Peru, he and Richard Shaw, the director of the ‘Watcher’ series, visited a necropolis, a huge desert cemetery, and a museum that had some forty skulls originally from the graveyard. While some of the elongated heads were shaped by “cradle-boarding,” a type of skull binding that led to cranial deformation, others appear to be genuinely anomalous, having just one parietal plate, he detailed. Some of the skulls also have a large pronounced ridge, and a heart-shaped dome in the rear that can’t be achieved through cradle-boarding, he continued. “I believe we are looking at some sort of genetic manipulation…that are the remains of the Nephilim,” from around 3,000 to 3,500 years ago, he added. Yes, without a doubt many elongated skull specimens were caused by cradle-boarding children when they were young. But where did those ancient tribes get that idea? Were they trying to emulate something that they had seen before? Were they trying to emulate a race of people that had been ruling over them at some point? But most scientists ignore this information because it does not fit in with their accepted version of ancient history. The ancient genomes, one from a Neanderthal and one from a different archaic human group, the Denisovans, were presented on 18 November at a meeting at the Royal Society in London. They suggest that interbreeding went on between the members of several ancient human-like groups living in Europe and Asia more than 30,000 years ago, including an as-yet unknown human ancestor from Asia. “What it begins to suggest is that we’re looking at a ‘Lord of the Rings’-type world – that there were many hominid populations,” says Mark Thomas, an evolutionary geneticist at University College London who was at the meeting but was not involved in the work. Yes, the ancient world was most definitely more of a “Lord of the Rings-type world” than most people would ever dare to imagine. Now of course the scientists in that article are still really grasping for straws to explain what the data is telling them. The theories that they present to the media as “facts” are really just theories that they have pulled out of their own imaginations. But what these scientists are starting to realize is that some really strange things happened to the human genome in the ancient world, and that is what the ancient texts have been telling us all along. Many ancient texts (including the Bible) tell us that long ago a group of fallen angels mated with human women and produced a race of hybrid creatures known as the Nephilim. In addition to the incredible testimony contained in these ancient texts, we also have physical evidence of this race of creatures still with us today. In a previous article entitled “Has An Ancient Giant Handprint Been Found In A Cave In Nevada?“, I discussed some examples of this evidence including a giant footprint, a photo of a giant finger and a giant handprint that has been preserved in a cave in Nevada. But the reality of the matter is that a group of giants could actually be protesting in front of the White House right now and a lot of people still would not believe this stuff. Because it simply does not fit in with what they have been taught all of their lives. According to the textbooks, none of this evidence is supposed to exist. So most people will continue to ignore what is right in front of their eyes. But the truth is out there – you just have got to be willing to go where it takes you.